In the first chapter of Gittin, we address the laws that apply to an envoy (שליח) who is charged with bringing a Get, a Jewish Bill of Divorce, to a woman living overseas. Such cases were clearly prevalent, so much so that they open this tractate, devoted to the rules of divorce. For many hundreds of years, these messengers carried out their religious duties and delivered the Get, but did so without much recognition in our literature. Today, one such envoy will be recognized for perhaps the most arduous trip ever undertaken to deliver a Get. That trip, which began in 1830, was from London to Sydney, Australia, and back again. It covered over 27,000 nautical miles and took close to thirteen months. 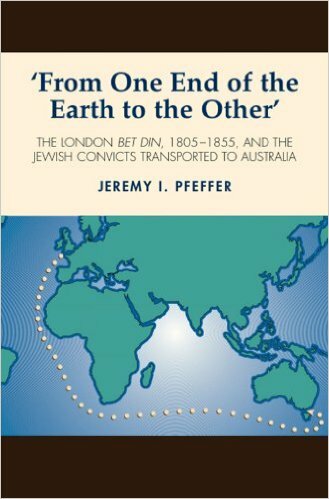 The trip is detailed in Jeremy Pfeffer's book From One End of the Earth to the Other, from where the following information is taken. On 23rd Mencachem Av 5590 [August 12, 1830] there appeared before us...a woman Mindela who is commonly known as Minka bat Yehuda Leib, and she appointed R. Aaron ben R. Yehuda of Lissa to be her agent to receive a Get from her husband Samuel who is commonly known as Long Zanvil ben Mordechai ben Meir who lives in Sydney on the sea coast in the State of South Wales...And let it be known that after discussing the matter the Gaon, Head of the Bet Din, and the Bet Din determined that the above R. Aaron, who is the agent for receipt (שליח לקבלה) of the above woman, will first effect the Get as an agent of accept acceptance before a Bet Din and witness to the handing over [of the Get]. And after he has received the Get from him with the intent of receiving, he will instruct the man to appoint him as his agent of delivery (שליח להולכה) and execute the Get as is required for an agent for transmission. The kind of agency that Rabbi Levy used was not common. Usually the envoy was acting on the husband's behalf to deliver a Get to his wife. Here however, Levy was acting on the wife's behalf to receive the Get from her husband. Once Levy received the Get, it would immediately take effect, even if the good rabbi never made it back to London. In addition Rabbi Levy would have to act as a Sofer and write the Get, and convene a Bet Din in Australia to verify the procedure. But first he would have to find Long Zanvil. R. Levy left for Australia on August 17, 1830 and arrived some three months later, on December 21, 1830. While there, he managed to track down Long Zanvil and convinced him to give a Get to his estranged wife. He then wrote the Get, and found five Jewish laymen: three to to act as a Bet Din and two to witness the handing over of the Get from the husband to the Rabbi. Rabbi Levy stayed in Sydney for five months, during which time his skills as a Sofer were put to good use. He sold a new Sefer Torah to the community, which he likely wrote himself, and repaired mistakes in several others. On the 27th of Tishrei 5592 [October 4, 1831], further to what is written above, the Gaon, Head of the Bet Din, executed the Get in accordance with the law of an agent for transmission...And when the agent gave the Get to the woman Mindela, who is commonly known as Minka bat Yehuda Leib, he declared "I wrote the Get with intent (לשמה) and the witnesses also signed it before me with the intent for the purpose of divorce. Why did Mindela wait for over twenty years before asking for a Get? Who financed the voyage, which cost about 100 pounds, which is over $15,000 today? Why did Rabbi Levy undertake the voyage without knowing where Long Zanvil was living, and whether he was prepared to give a Get? To the best of our knowledge, he was not related to any of the parties involved nor did he receive any great monetary renumeration for the mission. Putting our contemporary cynicism aside, we may believe that his motives were simply altruistic; there was a wrong that needed to be corrected and he alone could do so. And so we may fairly conclude that he undertook the mission to Australia simply for its own sake and for the sake of Heaven, לשמה ולשם שמים. Two years after his return from Australia, Rabbi Levy was appointed to the London Bet Din where he served as Dayan and Secretary. His mission, now all but forgotten, is a wonderful example of a rabbi doing the right thing to help a women obtain a Get. יהי זכרו ברוך.